In March 2018 we launched The ALL WOMEN Campaign which showcased some thirty empowering women from everyday life. These women just get on with it and wouldn’t think of what they do as special, but actually they are the most amazing individuals in their own unique and unassuming way. This year we are taking things a step further by creating an inspiring ALL WOMEN event. 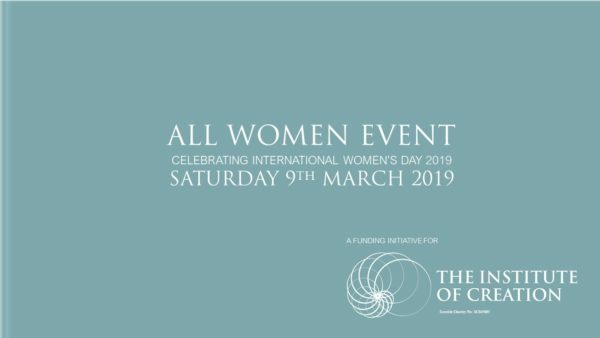 The event will take place on Saturday 9th March 2019, as part of our International Women’s Day* Celebrations. We invite you to join us celebrating International Women’s Day when you can hear many of their stories. An aspirational, empowering and fun ALL WOMEN’S Day Event raising funds for a Scottish Charity, The Institute of Creation. – DJ with music and dancing to a Pacific beat! Please note *International Women’s Day (IWD)* is Friday 8th March – The All Women Event takes place Saturday 9th March (the day after IWD). The idea of women supporting each other is not a new one but sadly, for many reasons, the simplicity of this way of being is being lost to us. In times past we experienced women around us in many ways; helping with baby care, elderly care, neighbourly care, births, birthdays, parties, weddings, Christmas, school duties, at church and in grief. The list goes on; so many wonderful stories and memories of great women doing small but heroic things everyday of life that made a real impact on all of our lives. Today, women are much more isolated; whether that be in the home, family, life or at work. We seem to be separate from each other and lack opportunities to come together and offer support. Social time is limited, as the stuff of life demands longer hours at work and often friendships with other women suffer as a consequence. This means that we are missing out on the nourishment and encouragement that comes from being with other likeminded and hearted women. Role models are important too; a recent survey noted that 58% of women say that they their role models are from ‘Reality TV’ and social media. It is so important for future generations that we offer credible and authentic role models. Established in 2016, Scottish Charity No: SC045865. The purpose of The Institute of Creation is to create a sense of belonging and to empower individuals with the resources which will enable them to live happy, healthy, abundant, purposeful and fulfilled lives. Are unemployed and have a desire to improve their circumstances. Are recovering from addictions and other life challenges. Are living in areas of deprivation but aspire to better their and their families’ lives. Have learning difficulties and/or who wish to engage in creative activity. Are children and young people who have disengaged from education. Are recovering from ill health and who wish to take control of their own health and well-being and create a brighter, healthier future. Have retired but still feel that they have a life to live and a valued contribution to make to society. Have experienced family trauma and wish to gain more hope and confidence.